This is an example of a converter meltdown. The converter was super-heated due to a raw fuel condition in the exhaust flow. The excess unburned fuel ignited when it struck the hot ceramic catalyst and drove the temperature far above the normal operating condition of the converter. The ceramic catalyst is unable to withstand the extremely high temperature and begins to melt. The ceramic collapses and the converter is destroyed. 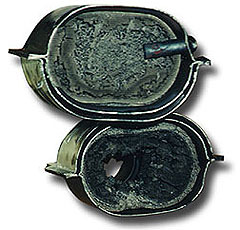 The melted ceramic may block the exhaust flow and cause additional damage to the engine. A converter glowing red-hot or evidence of heat discoloration confirm this situation. The too-rich condition that led to this converter melt down could be the result of a number of malfunctions including faulty oxygen sensor, an incorrect fuel mixture, worn spark plugs or plug wires, a faulty check valve, incorrect ignition timing, sticking float, faulty fuel injectors or other ignition malfunctions.